Universal Thumb-O-Prene™ The enhanced universal wrap-around neoprene design provides a low-profile comfortable, custom fit that is both functional and simple. 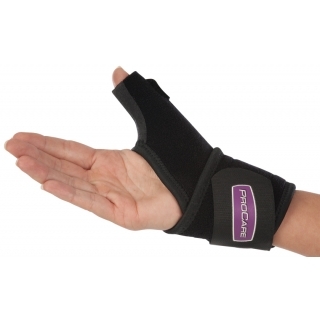 The unique design combines two stays, rigid and spiral plus a movable elastic strap to address various pathologies of the thumb including Tendonitis, Basal Joint Arthritis and instability of the CMC (Carpometacarpal) joint. The elastic strap may be wrapped between forefinger and thumb to help stabilize the CMC joint without restricting the use of the thumb or wrist. Bilateral fits right or left thumb.